The latest Ericsson Mobility Report has registered growth in total mobile network traffic across the globe of 70% between the end of Q1 2016 and the end of Q1 2017. Unsurprisingly this traffic growth is mainly driven by video streaming. 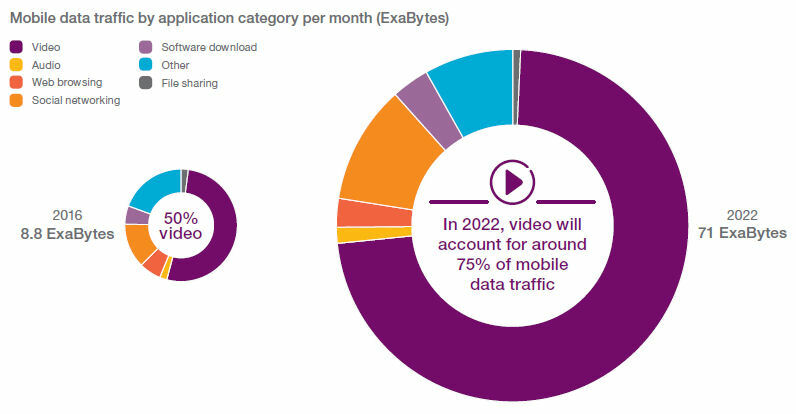 Video accounted for around half of the 8.8 ExaBytes of mobile data traffic used last year but by 2022 that propotion will have increased to three quarters as total traffic will reach 71 ExaBytes. In clear second place among mobile data application categories is social networking. Much of the other headline factoids from the report revolve around subscriber trends, with the number of global mobile internet subscribers apparently increasing by over a million per day. In addition the report forecasts that LTE will have become the dominant access technology next year, which will make it the mobile technology to achieve that feat most quickly. “Based on measurements made in hundreds of mobile networks, the Ericsson Mobility Report data truly illustrates the tremendous underlying growth in the industry,” said Niklas Heuveldop, Chief Strategy Officer at Ericsson. “4G subscriptions are increasing faster than ever, Voice over LTE uptake is accelerating and traffic growth has reached levels we have not seen since 2013. Those claims are illustrated in the first chart below. 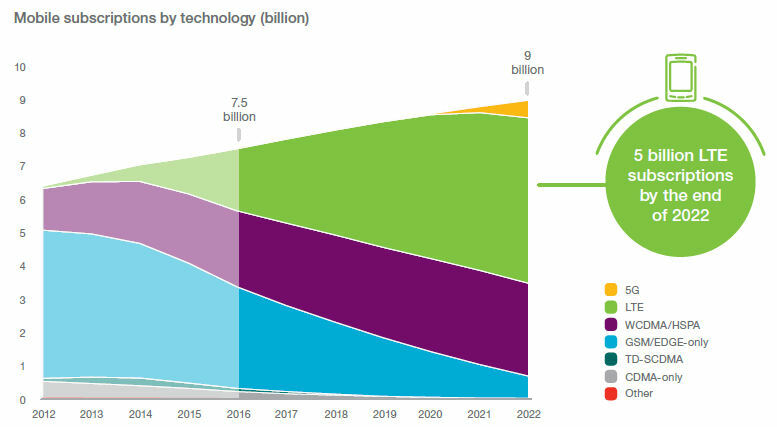 By 2022 Ericsson forecasts there will be over five billion LTE subscriptions alone and half a billion 5G ones, having only been made available to end-users in 2020. The chart seems to anticipate even quicker uptake of 5G than 4G experienced, which sets the scene for it to become the dominant mobile technology by 2025 or so. 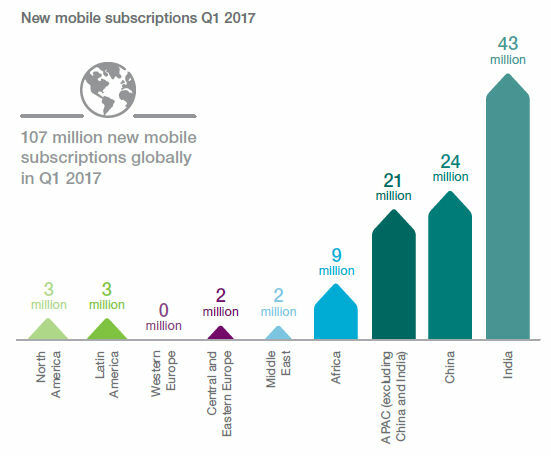 The vast majority of mobile subscription growth is coming from APAC, with India the primary driver thanks, in part at least, to the aggressive subscriber growth strategy adopted by Jio. The second chart illustrates this and reveals there is still plenty of growth coming from China, despite it having been growing rapidly for some time. The final table shows total mobile subscriptions by region/country. Again China and India dominate, while other populous developing countries such as Indonesia, Pakistan and Nigeria are growing rapidly. 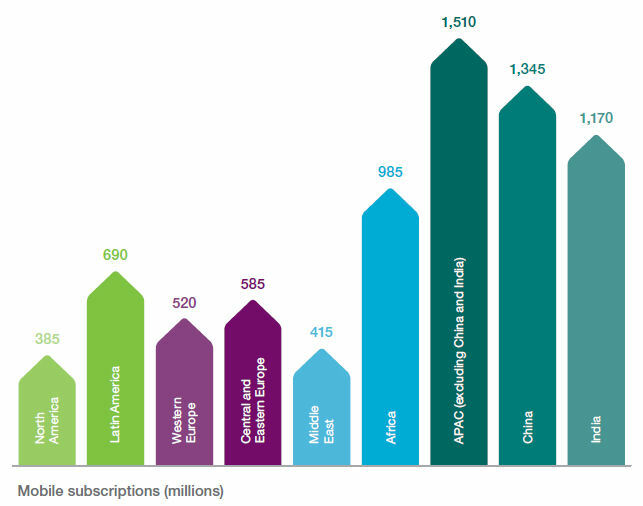 Ericsson reckons there are a total of 5.2 billion mobile subscribers and 7.6 billion subscriptions globally.